In September, Harold joined Anacor Pharmaceuticals in Palo Alto, California as vice president, human resources. Anacor is a biopharmaceutical company with six product candidates in development, focused on discovering, developing and commercializing novel small molecule therapeutics derived from its novel boron chemistry platform. Workforce Week, an e-newsletter for human resources professionals, with over 200,000 circulation, frequently asks Harold for contributions. His response to a question about training from a Stamford, Connecticut hospital in the 8/18 edition is reproduced here. Harold was invited as a guest lecturer at the University of Florida’s Warrington Graduate School of Business. It was a lively discussion with grad students, exploring team and individual performance, and ways to answer the question, “who is doing a better job?” He thinks he’s the only person to appear at the Warrington School as both a musician (a recent guitar duo performance for a recruiting-day event) and a lecturer. Harold's article describing a recruiting strategy for the current economy was published in the Management Research arm of Workforce journal. Harold is consulting for Cookie Marenco, principal and founder of Blue Coast Records and OTR Recording Studios. Cookie has engineered or produced five Grammy-nominated records, several Gold records and an Academy Award-winning documentary. She is an international thought leader in the emerging field of computer audiophile recording. To hear what that means, listen to any of the free samples at Blue Coast. You don’t need better equipment to hear a dramatic improvement, compared to the sound of MP3 or even CD-audio recordings. The “Cookie Collaboration” with Cookie Marenco has produced a high-definition, re-mastered version of Harold’s Out of Nowhere CD, with renowned jazz violinist Johnny Frigo, pianist Joe Vito, and bassist Jim Cox. You can hear it for free at haroldfethe.downloadsnow.net, or you can download individual tracks or the whole album. 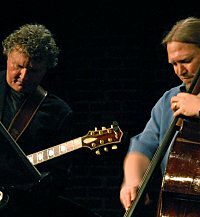 For the third consecutive season, Harold's trio performed at the 2009 San Jose Jazz Festival, at Theater on San Pedro Square. The Gamble Rogers Memorial Foundation has posted Harold’s biography and remembrance of Gamble Rogers from Fretboard Journal. Harold and Rob Kohler at the Theater on San Pedro Square, during the San Jose Jazz Festival on August 10. More photos. "The Missing Peace: Artists Consider the Dalai Lama" opened December 1, 2007 at San Francisco’s Yerba Buena Center for the Arts. Harold serves on the board of the Committee of 100 for Tibet, the sponsoring organization, and collaborated with artists David and Hi-Jin Hodge on their video installation titled “Impermanence.” The exhibit will remain until March 16, when it leaves for Tokyo. Presidential candidate Mike Gravel has retained hodgepictures and Harold Fethe to produce communications for his campaign. Hodgepictures and Harold produced the Gravel spot that ran during the CNN Democratic debates, and this one on YouTube as well. We are saddened by the loss of a friend, Renaissance man and inspiring collaborator. Violinist Johnny Frigo departed this life July 4. We shall miss him. USA Today reporter Del Jones interviewed Harold Fethe and Powerspeaking / Big Dogs founder Rick Gilbert for his Father’s Day article, which describes many employees’ tendency to see their company’s CEO as a father figure. Rick is quoted. Learning-management-software maker SumTotal was the only company to break into the top 150 Silicon Valley businesses. SumTotal is also the only company offering the Visual 360® performance appraisal system, acquired when MindSolve Technologies merged with SumTotal. Josh Bersin, Principal Analyst at Bersin & Associates, described the merger this way: "One of the most unique and powerful parts of MindSolve’s product is the ‘visual profiler,’ its patented visual rating system. The senior vice president of HR at ALZA [Harold Fethe], had a vision for the role of performance management and helped MindSolve build a state of the art system, which then became the core product of the company." Susanna, host of "Old, New, Borrowed and Blues" on Stanford's KZSU-FM (90.1), has been playing selections from the Out of Nowhere CD. Her show airs Thursdays 12-2, and you can listen to KZSU via streaming audio. Issue 3 of Fretboard Journal includes Harold's biographical portrait of Gamble Rogers, a Florida folk troubadour. Gamble's life and work are commemorated in a memorial organization, an annual folk festival, Jimmy Buffett's dedication of the Fruitcakes album, a middle school, a state park in Florida, and in the hearts and memories of Gamble's countless fans. You can listen to podcasts of Harold's interviews with the Florida Humanities Council and the Gamble Rogers Folk Festival, and can find Fretboard Journal at Barnes and Noble, Borders, and Tower. Harold sat in with Bruce Forman and Cow Bop at the River Inn in Big Sur August 6, at the start of their "On the Edge" tour of California. This fundraiser for Bruce Forman's kids' program, called JazzMasters Workshop, deserves your support. 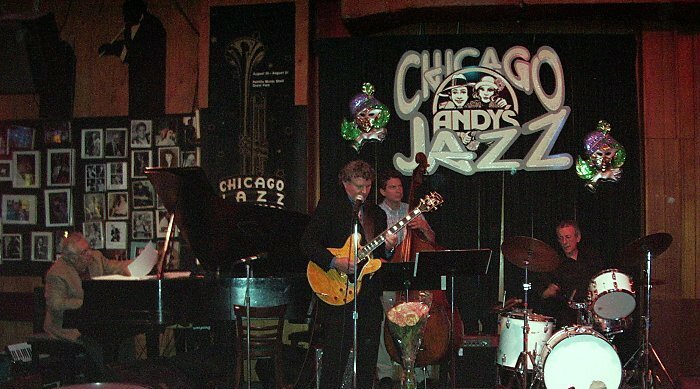 A launch concert for Out of Nowhere took place at Andy’s Jazz Club in Chicago on July 28. Check out a photo of the show. Fretboard Journal's second issue, featuring Harold’s article about Martin guitars — including an interview with Chris Martin IV, the fifth-generation CEO of this iconic American company — is available now at Barnes & Noble, Borders, and Tower. MindSolve Technologies reports a banner year, with sales booking up 177%, and a near-perfect renewal rate from happy customers. Fretboard Journal's debut met with critical and popular acclaim. Harold has the endpaper feature in this first issue, titled "World's Rarest Records." The new quarterly is available at many Barnes & Noble, Borders, and Tower locations. Harold has joined the board of Jazzmasters Workshop, jazz guitarist Bruce Forman's educational project that provides free instruction to kids. Harold will have an article appearing in an upcoming edition of Workforce, an on-line journal for human resources professionals. Harold performed at Courtyard Galleries, at a benefit for Omar Contreras of Half Moon Bay, a high school soccer star who has been recently diagnosed with aplastic anemia. Harold was recently interviewed by Alix Nyberg Stuart for CFO Magazine, a business journal for financial executives. The article will appear in an upcoming issue, and will explore communication challenges that organizations face when providing employees with feedback on their individual work performance. Several months ago, Harold accepted multiple responsibilities — advisor, writer, and editor — on the Dalai Lama Portrait Project. Believing the Dalai Lama to be among the most collaborative and least doctrinal among world religious leaders, Harold is honored to be invited as a contributor on this project. Harold was interviewed by the Gainesville Sun in a March, 2005 article about MindSolve's director of market research, Dr. Robert McPeek. Harold received generous acknowledgement in The Performance Appraisal Handbook (Berkeley, CA: Nolo Press, 2005) for his work as an advisor to Nolo Press on the content and presentation of the Handbook. Nolo is a leading provider of do-it-yourself legal books for consumers and small businesses. Harold has received an offer of collaboration in an upcoming work by internationally known artist Guy Buffet. Guy has begun work on a personal retrospective, creating images that memorialize a particular "sense of place" that he associates with important experiences in his artistic development.